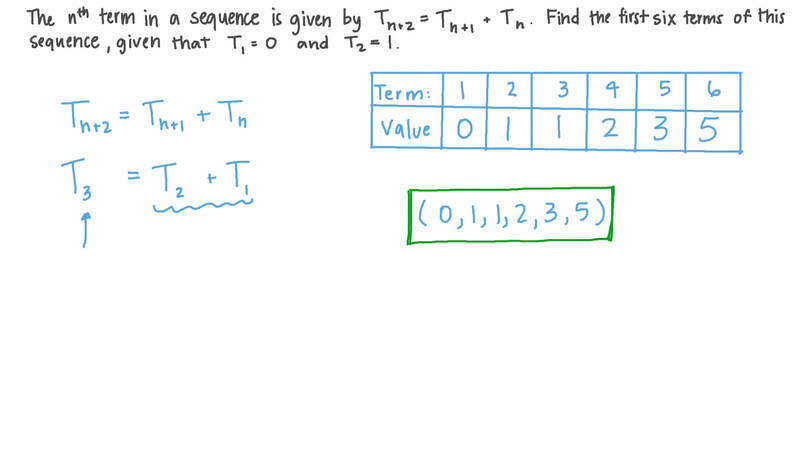 In this lesson, we will learn how to work with sequences in recursive form. Find the first five terms of the sequence with general term 𝑇 = 𝑇 + 5 𝑛 + 1 𝑛 , where 𝑛 ≥ 1 and 𝑇 = − 1 3 1 . The 𝑛 t h term in a sequence is given by 𝑇 = 𝑇 + 𝑇 𝑛 + 2 𝑛 + 1 𝑛 . Find the first six terms of this sequence, given that 𝑇 = 0 1 and 𝑇 = 1 2 . Find the arithmetic sequence in which 𝑇 = − 1 0 0 1 and 𝑇 = 4 𝑇 4 𝑛 𝑛 . Given that and that for , find a formula for in terms of . Find 𝑇 + 𝑇 + 𝑇 1 3 1 4 1 5 given 𝑇 = − 3 1 and 𝑇 = 𝑇 + 5 8 𝑛 𝑛 − 1 . The 𝑛 t h term in a sequence is given by 𝑇 = 𝑛 𝑇 𝑛 + 1 𝑛 . Find the first six terms of this sequence, given that 𝑇 = − 1 1 8 1 . Find, in terms of 𝑛 the general term of the sequence which satisfies the relation 𝑇 = 2 2 𝑇 𝑛 + 1 𝑛 , where 𝑛 ≥ 1 and 𝑇 = 2 2 1 . List the next 6 terms 𝑎 , … , 𝑎     . By listing the elements 𝑎 , 𝑎 , 𝑎 , 𝑎 , …      , give a formula for 𝑎     , in terms of 𝑛 , for 𝑛 ≥ 1 . Give a formula for 𝑎     , in terms of 𝑛 , for 𝑛 ≥ 1 . Give a formula for 𝑎     , in terms of 𝑛 , for 𝑛 ≥ 1 . Give a formula for 𝑎   , in terms of 𝑛 , for 𝑛 ≥ 1 . What is 𝑎      ? Solve 𝑎 = 1 7  for 𝑛 . What is the range of the function 𝑎  ? Consider the following sequence of dots. What is the function 𝑓 such that 𝑓 ( 𝑛 ) is the number of dots in the 𝑛 th pattern? The graph represents the triangle wave function 𝑇 ( 𝑥 ) , which is periodic, piecewise linear, and defined for all real numbers. List the values of 𝑇 ( 0 ) , 𝑇 ( − 1 ) , and 𝑇 ( 1 2 3 4 ) . List the values of 𝑇  1 2  , 𝑇  3 2  , 𝑇  5 2  , and 𝑇  1 2 3 3 2  . What is 𝑇  − 4 9 3 3 2  ? If we are given that 𝑇 ( 𝑏 ) is negative, what can we conclude about the number 𝑏 ? A There is some integer 𝑛 for which 2 𝑛 + 1 < 𝑏 < 2 𝑛 + 2 . B There is some integer 𝑛 for which 2 𝑛 < 𝑏 < 2 𝑛 + 1 . C 𝑏 is an even integer. D 𝑏 is an odd integer. Find the equation of the line segment on which the point ( 𝜋 , 𝑇 ( 𝜋 ) ) lies. Hence find the value of 𝑇 ( 𝜋 ) correct to 3 decimal places. Given the sequence defined by 𝑇 = 𝑇 + 𝑛 𝑥 𝑛 + 1 𝑛 , where 𝑇 = 2 7 1 and 𝑇 = − 7 8 3 , find the value of 𝑥 . Find the first five terms of the sequence with general term 𝑇 = 𝑇 − 1 3 𝑛 + 1 𝑛 , where 𝑛 ≥ 1 and 𝑇 = 1 1 . Find the first five terms of the sequence with general term 𝑇 = 𝑇 − 3 𝑛 + 1 𝑛 , where 𝑛 ≥ 1 and 𝑇 = 1 9 1 . Find the first five terms of the sequence with general term 𝑇 = 𝑇 + 2 6 𝑛 + 1 𝑛 , where 𝑛 ≥ 1 and 𝑇 = 2 0 1 . Find the first five terms of the sequence with general term 𝑇 = 𝑇 + 3 𝑛 + 1 𝑛 , where 𝑛 ≥ 1 and 𝑇 = − 4 1 . The 𝑛 t h term in a sequence is given by 𝑇 = 𝑇 + 𝑇 𝑛 + 2 𝑛 + 1 𝑛 . Find the first six terms of this sequence, given that 𝑇 = 9 1 and 𝑇 = 1 1 1 2 . The 𝑛 t h term in a sequence is given by 𝑇 = 𝑇 + 𝑇 𝑛 + 2 𝑛 + 1 𝑛 . Find the first six terms of this sequence, given that 𝑇 = 1 6 3 1 and 𝑇 = − 1 3 0 2 .